Bronson's Little Axe - Part One - Wisdom is the retention of innocence through adversity. Henry David Thoreau was the most responsible, literate, and eventually influential member of the "Transcendental Club" in the mid 1800's. He later became THE touchstone for subsequent environmentalists, civil rights leaders, and even Hippies in the 1960/70's. While Sergent Pepper and Woodstock and assassinations were going on, people were reading Thoreau, and being inspired as to the rights of all natural creatures, and to move off the grid to live independently and with self-determination. He came from a time when it was relatively OK to experiment with social systems, because this was a new nation newly discovering and creating itself - and Thoreau continues to inspire radicals, revolutionaries and constitutional-libertarian survivalists who voted for Trump, even. I'm just sayin'. Who was (later) inspired by Thoreau? Louisa May Alcott. The Transcendentalists. The Abolitionists. The social reformers like Jane Addams, Susan Day, and Florence Nightingale. Environmental writers and leaders like Gifford Pinchot, John Muir, Aldo Leopold, (probably Rachel Carson), E.O. Wilson, Loren Eisley, Robert F. Kennedy Jr., and Bill McKibben. B.F. Skinner, ("Walden 2"). William Butler Yeats. George Bernard Shaw. Sinclair Lewis. Upton Sinclair. Ernest Hemingway. Frank Lloyd Wright. Leo Tolstoy. Mohandas Ghandi. John F. Kennedy. Martin Luther King. "Right-wing" theorist Frank Chodorov. Al Gore - need I say more? Mohandas Gandhi first read Walden in 1906 while working as a civil rights activist in Johannesburg, South Africa. He first read Civil Disobedience "while he sat in a South African prison for the crime of nonviolently protesting discrimination against the Indian population in the Transvaal. The essay galvanized Gandhi, who wrote and published a synopsis of Thoreau's argument, calling its 'incisive logic [...] unanswerable' and referring to Thoreau as 'one of the greatest and most moral men America has produced'." He told American reporter Webb Miller, "[Thoreau's] ideas influenced me greatly. I adopted some of them and recommended the study of Thoreau to all of my friends who were helping me in the cause of Indian Independence. Why I actually took the name of my movement from Thoreau's essay 'On the Duty of Civil Disobedience', written about 80 years ago." Thoreau was, himself, influenced by others, mainly the Concord Transcendentalists and the philosophers they studied, like the German Transcendentalists, Kant, Carlyle, Locke, Socrates and the classical Greeks, and Indian Religion/Philosophy. Thoreau had a great interest in the latter - not unlike another seminal vanguard, George Harrison. What he and other Transcendentalists were tryin to do were to test Christianity, remould it, or go beyond it. The Christianity of the day may have been a tad stultifying, as we can gather from accounts of Concord as being, "soulless" and boring. On the other hand, rapid urbanisation and expansion were dredging up demons of the flesh which stolid Christianity was not agile at negotiating. Thoreau and others, along with an evangelical revival at the time, were seeking to be honest with their inner light, and thereby re-infusing the Christianity of the time with a more dynamic spirituality, tolerant and loving of the vicissitudes of Nature. In parallel, the nature and rights of blacks, (along with the rights of states), were being questioned by Darwinism, (and social Darwinism). I have posted about this contest earlier - see my Thoreau tag. Most of the Transcendentalists were ardent Abolitionists, but it was Thoreau who transferred the idea of the divinity of Nature onto blacks, and actively demanded their freedom, while also actively working to shelter and help blacks fleeing the South. It was Thoreau who brought John Brown into wide national attention. The writings of Brown, Thoreau and others helped turned much public opinion towards sympathy for what had been considered a violent agitator - a traitor - an animal. And this - Wiki: "Henry David Thoreau's civil disobedience was apparently influenced by Shelley's non-violence in protest and political action." - See works, e.g., (1819) The Masque of Anarchy, &, (1819) A Philosophical View of Reform (published in 1920). Oh - and I am absolutely certain that Thoreau's civil disobedience was influenced by the death of Socrates, who gave his life for the higher ideals which the state itself must strive to uphold. And, of course, it was also influenced by the crux of Christianity, the crucifixion of Jesus. As I said, Thoreau was also influenced by other Transcendentalists, most importantly, his patron in spirit and thought, Ralph Waldo Emerson. In 1836, Emerson published the seminal work of the American Transcendentalists, "Nature." (This is recommended reading!) I find the ideas crystalised in this work to be, like Indian philosophy, oracular of quantum physics, and of the thought of Alfred North Whitehead. Thoreau was greatly inspired by, "Nature," and applied it to his life, thought and studies. In this essay Emerson put forth the foundation of transcendentalism, a belief system that espouses a non-traditional appreciation of nature. Transcendentalism suggests that the divine, or God, suffuses nature, and suggests that reality can be understood by studying nature. Emerson's visit to the Muséum National d'Histoire Naturelle in Paris inspired a set of lectures he later delivered in Boston which were then published. (In this essey, Emerson asserts that humans normally do not appreciate or give back to Nature, for all it gives to them. Of course, this is absolutely true. Our civilisation thrives, and dumps its entropy back upon Nature, to our own imperilment. But, this is part of our nature itself, as we process information more salient to us, and do not make coherent to our thought, awareness and ways all the vast, overwhelming, discrete and sublime information, and being, quietly resounding throughout our existence. We are even more crude, cruel and ignorent when we are stressed and rushing under the demands of Time, as in the bigger cities, or in corporations, or in war - as if we are in a fight-or-fight struggle for our lives, even if only conceptually! Our ignorance of Nature is exemplified and personalised - alas, "anthropomorphosized," - by our stepping over homeless or injured people, in our rushings to the Office, where springs the eternal green substinance called money). Thoreau took such ideas very seriously, very personally. He became a great observer and chronicaller of nature. He taught others. And he looked up to another Transcendentalist - who was also an Abolitionist - Bronson Alcott. In many ways, Thoreau, (and Emerson), saw in Alcott the ideal common, yet transcendental, man: The "Everyman." Alcott was, himself, inspired by Bunyan's historic Christian work, "Pilgrim's Progress," where the common man was capable of knowing God, even if he were but merely, "good enough." It was by example of Alcott, who refused to pay a poll tax in 1843, in opposition to slavery and to the related issue of the annexation of Texas. Thoreau would later refuse a tax on similar grounds, in 1846, which would ultimately become the spine of his greatest political and moral essey, "Civil Disobedience". In 1837, Alcott had insisted on allowing a black girl to attend his school for children. Later, he would make close acquaintance with Charles Lane, from England. As you may know, England abolished slavery in 1799. Progressive Lane had views which were Abolitionist in the USA, and these reinforced Alcott's own beliefs and feelings. I am sure that Alcott was also influenced by the famous Abolitionist, William Garrison, and Emerson, his friend and patron. These combined to motivate his act of civil disobedience in 1843, which directly influenced Thoreau. With financial support from Emerson, Alcott left Concord on May 8, 1842, to a visit to England, leaving his brother Junius with his family. He met two admirers, Charles Lane and Henry C. Wright. The two men were leaders of Alcott House, an experimental school based on Alcott's methods from the Temple School located about ten miles outside London. The school's founder, James Pierpont Greaves, had only recently died but Alcott was invited to stay there for a week. Alcott persuaded them to come to the United States with him; Lane and his son moved into the Alcott house and helped with family chores. Persuaded in part by Lane's abolitionist views, Alcott took a stand against the John Tyler administration's plan to annex Texas as a slave territory and refused to pay his poll tax. Abby May wrote in her journal on January 17, 1843, "A day of some excitement, as Mr. Alcott refused to pay his town tax... After waiting some time to be committed [to jail], he was told it was paid by a friend. Thus we were spared the affliction of his absence and the triumph of suffering for his principles." The annual poll tax was only $1.50. 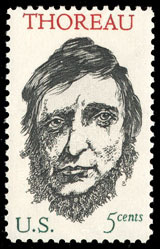 The incident inspired Henry David Thoreau, whose similar protest led to a night in jail and his essay "Civil Disobedience". Around this time, the Alcott family set up a sort of domestic post office to curb potential domestic tension. Abby May described her idea: "I thought it would afford a daily opportunity for the children, indeed all of us, to interchange thought and sentiment". Thoreau revised the lecture into an essay entitled "Resistance to Civil Government" (also known as "Civil Disobedience"). It was published by Elizabeth Peabody in the Aesthetic Papers in May 1849. Thoreau had taken up a version of Percy Shelley's principle in the political poem "The Mask of Anarchy" (1819), which begins with the powerful images of the unjust forms of authority of his time and then imagines the stirrings of a radically new form of social action." So, you see, Thoreau was an agent of the ideas of Bronson, and of Emerson, and of Shelley. We should be very thankful that this younger Transcendentalist was able to synthesize, clarify and popularize these ideas for the ages to come. Even during the Madison protests of 2011, and during OCCUPY, Thoreau held onto his perch, like some lost canary in a coal mine, still sending out his message to guide others to the light, inspiring them and pushing them onwards. "I borrowed an axe and went down to the woods by Walden Pond..."
Thus, that axe would change history forever. Where, by the way did he get this axe? From the common estate of poor Bronson Alcott. It became the axe heard around the world - perennially! Axes?! Axes?! Pay your taxes!